In this worksheet, students will learn about acids and alkalis and how they react together in neutralisation reactions to form a salt and water. 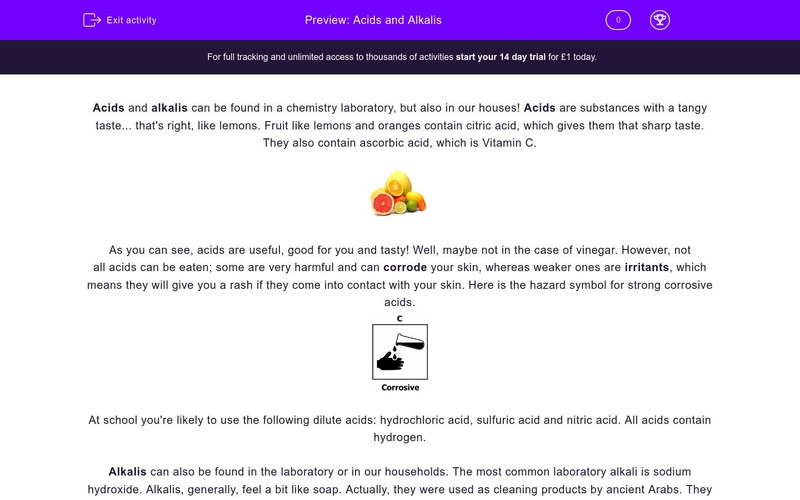 Acids and alkalis can be found in a chemistry laboratory, but also in our houses! Acids are substances with a tangy taste... that's right, like lemons. 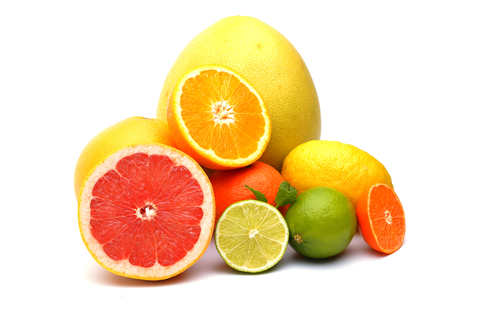 Fruit like lemons and oranges contain citric acid, which gives them that sharp taste. They also contain ascorbic acid, which is Vitamin C.
As you can see, acids are useful, good for you and tasty! Well, maybe not in the case of vinegar. However, not all acids can be eaten; some are very harmful and can corrode your skin, whereas weaker ones are irritants, which means they will give you a rash if they come into contact with your skin. 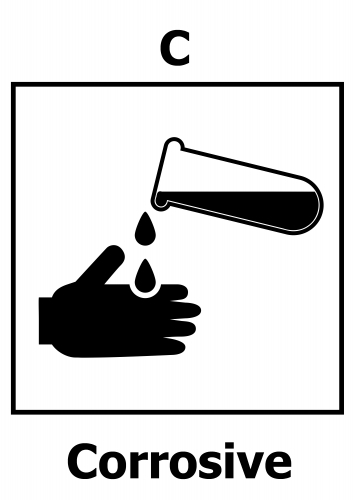 Here is the hazard symbol for strong corrosive acids. At school you are likely to use the following dilute acids: hydrochloric acid, sulfuric acid and nitric acid. All acids contain hydrogen. Alkalis can also be found in the laboratory or in our households. The most common laboratory alkali is sodium hydroxide. Alkalis, generally, feel a bit like soap. Actually, they were used as cleaning products by ancient Arabs. They were made with ash and animal fat. Today, most cleaning products are alkalis, for example, toothpaste, soap and oven cleaners. In a way, alkalis are the opposite of acids. There can be weak alkalis and strong alkalis, which are caustic, like caustic soda. Caustic substances can burn our skin. There is a way to identify whether a substance is an acid or an alkali. It is called the litmus test. A special paper called litmus paper is dipped into the substance. There is red litmus paper and blue litmus paper. No matter what the initial colour is, acids will turn litmus paper red and alkalis will turn litmus paper blue. A neutral substance, one which is neither an acid nor an alkali, will turn litmus paper purple. There is another test, which can also tell us how acidic or alkaline a substance is - this is the pH test. You can see the pH scale below. There is a special solution called universal indicator solution. When a few drops of universal indicator are added to a substance, it turns a colour. This colour matches one of the colours on the pH scale and that's how you determine how acidic or alkaline a substance is. What is the scientific name for vitamin C? Tick three acids we can eat or drink from the list below. Tick three alkalis we use at home from the list below. Strong acids can be ___________. Strong alkalis can be ___________. Lime juice turns blue litmus paper red. Is lime juice an acid or an alkali? 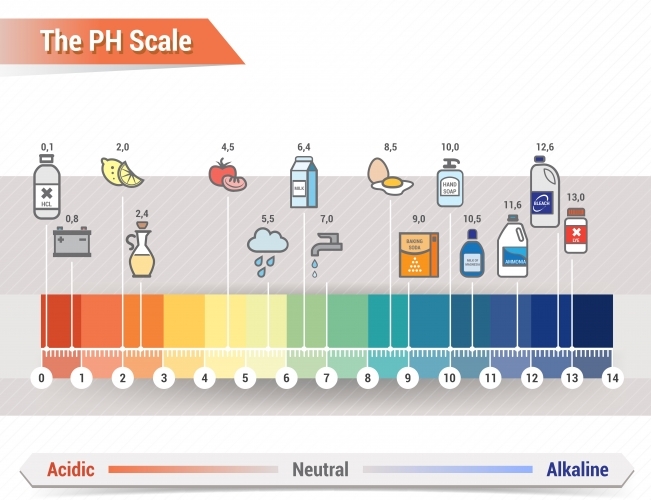 This is the pH scale that you came across in the introduction of this worksheet. A neutral substance turns green when universal indicator solution is added. What is the pH of the substance? Find green in the scale and check what number it corresponds to. This is the pH scale that you came across in the introduction of this worksheet. An alkaline substance turns dark blue when universal indicator solution is added. What is the pH of the substance? Find dark blue in the scale and check what number it corresponds to. Acids and alkalis react together to produce neutral substances. What is this type of reaction called? Acids taste tangy, like lemons. Vitamin C is called ascorbic acid. Orange juice, vinegar and lemonade can be consumed as drinks or in food. The other two acids are only used in the laboratory. Toothpaste, caustic soda and oven cleaners are alkalis used at home for cleaning purposes. Sodium hydroxide is only used in the laboratory, whereas water is a neutral substance. Lime juice is an acid and, like all acids, turns litmus paper red. Neutral substances turn universal indicator green; their pH is 7. Alkaline substances turn universal indicator dark shades of blue-green, purple and blue. For dark blue you have to go to the far right end of the pH scale. The pH is 14. Acids and alkalis react together and the reaction is called neutralisation, because neutral substances are produced.